It’s hard to imagine that IUPUI’s 500-acre campus, with its institutional buildings and sprawling parking lots, once contained intimate neighborhoods with narrow streets and corner drug stores. But before Indiana University’s School of Medicine moved to the area in the early 1900s and IUPUI formed in 1969, these west-side streets looked much like the working-class neighborhoods seen on the east and south sides. The area was sprinkled with stores, businesses, and hundreds of homes with workers traipsing off daily to work at factories on the nearby White River, including the Indianapolis Bleaching Works, Acme Evans Flour Mill, and Kingan and Company, a large meatpacking company. Brick stores anchored three of the corners at the intersection of West New York and Blake Streets, photographed by Indianapolis Power and Light in 1927. This view looks west at a three-story brick commercial building housing Hoskins and Miller Drugs on the southwest (left) and Herbert R. Hahn Meats to the right. Wood frame flats and doubles line New York Street with the tower of the old Casper Maus Brewery (then part of Indianapolis Brewing Company) seen in the distance. Note the streetcar tracks curving south from Blake Street and heading east on New York Street. By 1935, the corner drug store was now known as Dugan Pharmacy and the clutter of electric poles and overhead wires had been slightly reduced. 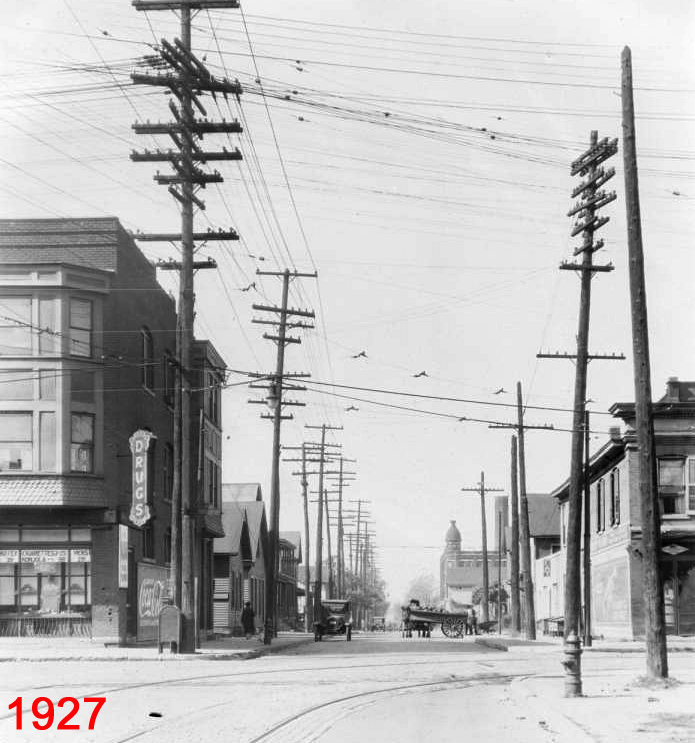 Indianapolis Power and Light, a new electric company formed in 1926, took these before-and-after photographs to document efforts to combine the lines of the old companies (Indianapolis Light and Heat and the Merchants Heat and Light). 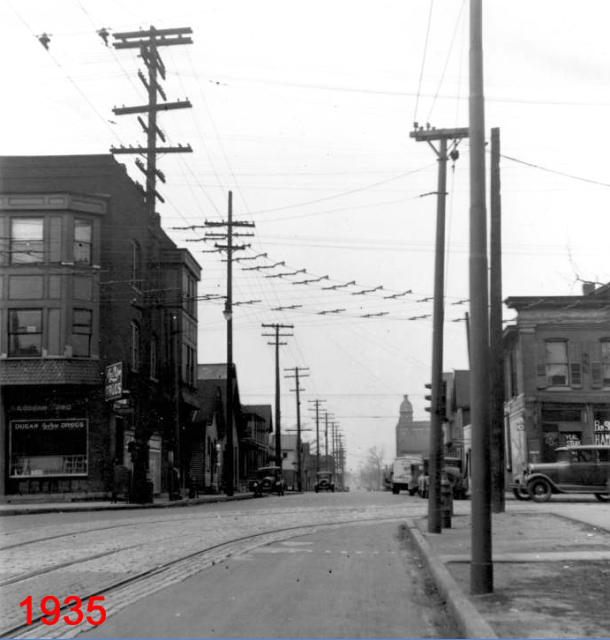 Before the merger, the poles and lines of the old competing electric companies often ran along opposite sides of the same street. Upon completion of the unification project, about 500 miles of duplicate pole lines had been eliminated. The old Indianapolis Brewing Company operated until the 1940s and the building housed other businesses until demolished in about 1970. In 1969 Indiana University and Purdue University formed IUPUI (an awkward university name originally nicknamed “oo-we, poo-we”) to combine all of its Indianapolis schools and buildings onto one urban campus. Throughout the next decades, the school systematically bought about 2,000 pieces of property (only a handful using eminent domain), razing nearly all as the campus built, expanded, and had need for more parking. Today the thriving campus grants over 250 degrees in twenty-one schools and is attended by 30,000 students. “Mary Cable Building” (a converted elementary school where I took my first class at IUPUI and once practiced with the IUPUI band) has now been replaced by a parking garage. Fantastic article Joan! Views of this long-vanished neighborhood are extremely rare and a real treat to see. The blues singer Leroy Carr was arrested not too far from here (at New York and Agnes Street) in 1928 for possession of bootleg liquor. His car hit a fire hydrant and the young lady that Carr was with jumped out with the liquor and ran up to a house at that intersection when the police nabbed them. At that time indictments were handed down to several people in the area for violating the Volstead Act. I have also heard that was the possible connection to the unsolved murder of an IPD patrolman outside of his Irvington home that same year. His beat was in this neighborhood. Carr went on to record How Long Blues for a mobile recording unit in Indianapolis later in the Summer of 1928. The Casper Maus Brewery stood on the corner of New York and Agnes Streets. I am not sure, but I think I remember reading that they came from the Alsace-Lorraine region. 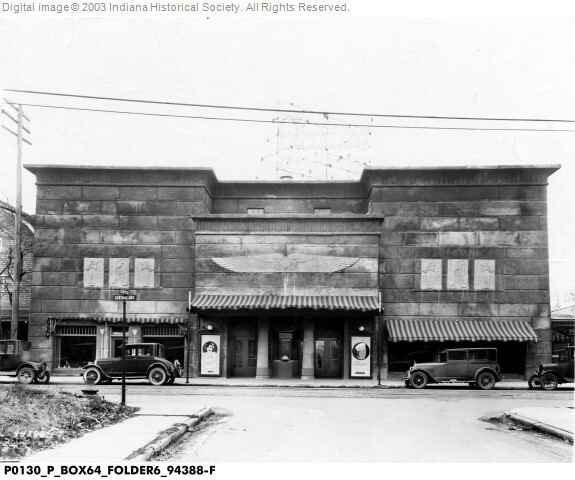 The Maus family home was somewhere around the site of the IUPUI Natatorium–across from the Brewery. Many years ago I came across a photo of Casper Maus’ daughter Magdalena (named for her mother). It was a cabinet card taken in 1884 at the studio of Cadwallader and Fearnaught. Casper’s son Frank changed his last name to Fauvre and married Julia Schmidt of the Schmidt Brewery/Indianapolis Brewing Company fame. I think I also recall that Frank also had a brother named Casper who died as a young man in the 1880s-1890s. The Indianapolis Historical Society has a catalog from the late 19th century which has a nice woodcut of the Maus Brewery. 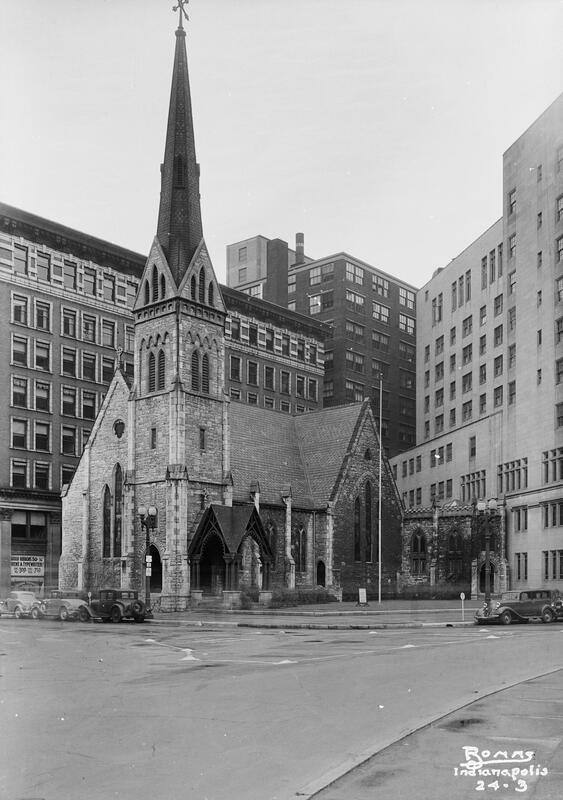 In thinking further about the Leroy Carr story, I believe that the arrest took place at Agnes and Michigan (present site of Cavanaugh Hall) and not Agnes and New York. I love this one Joan, I worked part time all four years of high school for Tom Dugan at his drug store. 1956 into 1959 then I moved to Chicago. 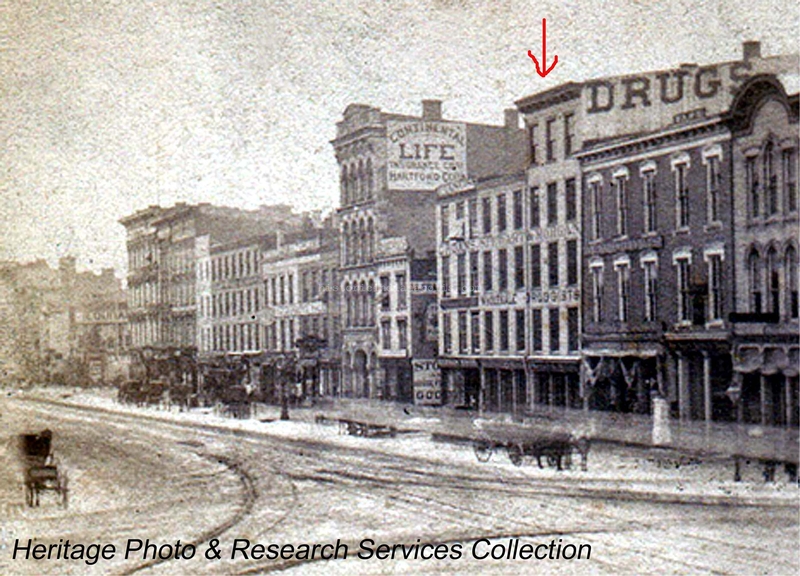 Tom Dugan lived in the Michigan Hotel located at 127 Michigan St. I was a (soda jerk) and did the stocking in the drug store. 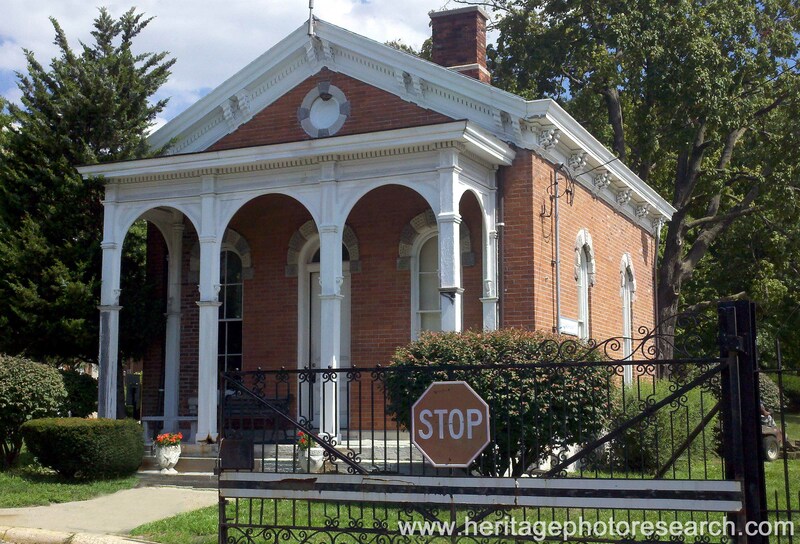 My family lived at 321 Minerva St where the IUPUI Natatorium is located today. Minerva St. came to a dead end at the bleaching mill property, most of the people living on our block worked at this mill untill it closed down in the 50s. Sunday was always very busy at this drug store as this was boot leg day and a lot of liquor was sold. In the 1935 photo you can see the barber pole on the house behind the drug store, that was Harms barber shop, we kids could get our hair cut there for 25 cents. Across New York St from the barber shop was The New York Drygood store. On the South East corner of Blake and New York was a Regal Grocery store. David, Thanks for the information about Leroy Carr. When I was doing some research about fifteen years ago trying to find musicians buried at Crown Hill (he’s at Floral Park darn it and if I remember correctly, Scrapper Blackwell is in New Crown, as is Wes Montgomery) the local library did not have any of his records available, but while I was traveling though Europe around the same time I found Leroy Carr CDs in a small town in Italy and and in London. I think I bought that one. Albert Fearnaught, the photographer you mention is buried at Crown Hill and interestingly enough also designed a casket that could signal above ground if it turned out that the deceased was not really deceased and woke up underground. According to my sources, Officer Paul Miller was patrolling near a drugstore at 2500 N. Station Street when he was killed in an exchange of gunfire with two crooks, neither of whom were apprehended. He died the next day, July 18, 1928 and is buried in Sec 65 Lot 656 along the 38th Street brick fence. Three police officers died in 1928 in the line of duty.